Here's How You Can Easily & Safely Organize All Your Tools & Accessories On Your Pegboard! Why waste your time and effort with cheaply-made and flimsy pegboard jar organizers? Now you can make sure that all your screws, nuts, bolts and other accessories are neatly organized and firmly in place. How? Introducing The World Axiom Ultimate Pegboard Jar Organizers For 1/8" & 1/4" Pegboards! We have designed these industrial-strength jar organizers to make your life easier and your DIY projects as fuss-free as possible. The robust construction and user-friendly design will allow you to easily store and organize your accessories without any hassle. o Sturdier Than Other Flimsy Jars - our jar organizers are made from superior-quality PET plastic, which is crush and impact resistant as well as scratch-resistant. o Larger Design For Extra Storage Space - our 2" x 3" jars can hold screws up to 2" long, so you can easily store even larger accessories without the slightest problem. o Easy One-Handed Lock System - the ¼ turn locking system will allow even children or seniors to easily use the jar organizers and securely lock them in without any struggle. o Organization Made Easier - the caps will stay on the pegboard, so you can easily find the exact spot for your jar and avoid creating a mess. o Perfect For All Pegboards - our jar organizers are compatible with both 1/8-inch and 1/4-inch pegboard holes, so you can easily use them anywhere you like! Ideal for crafts, sewing, quilting, scrapbooking, garage accessories and any other DIY project, our heavy-duty pegboard jars are covered by our LIFETIME warranty, so you can rest assured that they will last for a lifetime! Click "Add To Cart" NOW & Make Your Life Easier Than Ever! WHILE COMPETITOR'S JARS ARE CHEAPLY-MADE & BREAK WHEN YOU TRY LOCK THEM IN, our premium pegboard jar organizers are made from heavy-duty PET plastic, which means they are durable and crush-resistant. 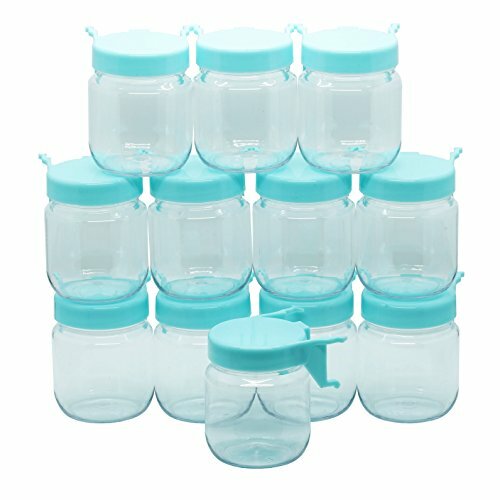 Plus, our industrial strength jars are as strong as glass baby jars, so you can rest assured they will not break easily. The perfect pegboard accessories for all your needs! SAVE YOUR PRECIOUS TIME WHILE WORKING ON YOUR NEXT PROJECT by choosing our sturdy pegboard organizer, which features a ¼ turn lock system that makes it ideal for one-handed use and perfect for kids and seniors. Why waste your time and effort when you can easily hook and lock the pegboard storage organizer within seconds? DON'T FORGET OUR PEACE-OF-MIND LIFETIME GUARANTEE! We know that finding the right tools and accessories for your garage, kitchen, workspace or DIY projects can be challenging and that's exactly why we back our elite garage pegboard accessory jars with our exclusive LIFETIME warranty! UNLIKE LOW-QUALITY PEGBOARD STORAGE CONTAINERS THAT DON'T FIT ALL PEGBOARDS, the EdgeWorks pegboard accessories kit is designed to fit both 1/8" and 1/4" pegboards and help you save money, since you don't have to buy different jar organizers for your different pegboards. Our goal is to offer you a pegboard accessories set solution that will make your life easier. KEEP YOUR WORKSPACE NEATLY ORGANIZED & TIDY with our robust garage pegboard organizer, which are clear so you can instantly find your items without wasting time. Plus, the caps will stay on the pegboard, so you know exactly where each jar goes, thus keeping your quilting, sewing, scrapbooking and DIY tools tidy and neat. Get your pegboard organization system today! If you have any questions about this product by WORLD AXIOM, contact us by completing and submitting the form below. If you are looking for a specif part number, please include it with your message.